Since the dawn of affiliate marketing, advertisers and publishers have been looking to find the right balance between quality traffic and higher payouts. Advertisers want to make sure they only attract the right crowd to increase their conversion rates and publishers want to make sure they get paid their worth while still maintaining the integrity of their website/blog/media channel. This need to find the right match is what gave rise to the popularity of affiliate networks. Think of affiliate networks as matchmakers; they match advertisers with the right publishers, they mediate all proceedings between the two parties, they make sure both parties are getting what they came for, and they strive to make a good impression while doing so. Basically, they do all the legwork to find and maintain that essential balance. Seems like an inspired solution to affiliate marketing woes right? Unfortunately, it isn’t as simple as that. Not all affiliate networks deliver what they promise. In fact, most networks in the industry, nowadays, are simply re-brokering networks; they act like search engines by copying orders from other networks and showcasing them as their own. Even if you find a legitimate affiliate network, they might not be able to get you the traction you need or the payout you were hoping for. This is where networks like AdCombo come in. They house legitimate offers, they find you the right match, and they deliver promised results efficiently. While AdCombo caters to both publishers and advertisers, this article is focused on reviewing their services for publishers. Let’s take a deeper look into how AdCombo stands out from the crowd. AdCombo is an affiliate marketing network that started its operations in early 2014 and has gained quite a reputation in such a short time. They are headquartered in Canada, but hold operations in 5 other cities around the globe. Before going live, the company spent close to a year running their software in private, working out the glitches, and making sure their services were top notch. This is one of the reasons why the network was able to garner such an excellent reputation so quickly. AdCombo offers affiliate marketing and advertising solutions to both publishers and advertisers, promising to deliver better results faster. The reason why they stand out from their competition is that they have identified CPA Marketing as a niche and promote it as their specialty. This approach helps them communicate a clear value proposition to their clientele and establish their brand as an industry leader. CPA (Cost per Action or Acquisition) is a popular affiliate marketing strategy among publishers because it promises a greater payout (than banner advertising) without disrupting the nature or experience of their blog/website/media channel. With CPA, publishers get paid whenever someone clicks on the affiliate link that is advertised and takes a predetermined action. This action can be as simple as filling out a form or complicated like making an actual purchase. Though the concept is pretty straightforward, the execution can get a little tricky for publishers as they integrate the affiliate’s link into their content. AdCombo helps demystify the process by breaking it into simple steps and taking on a lot more work in terms of designing landing pages and Ads so that the publisher doesn’t have to worry about customizing anything. As AdCombo specializes in CPA Marketing, they are able to provide a better, more personalized service to publishers than other affiliate marketing networks. What we liked about the company: The COD model is a new tangent we liked exploring. The customer service is great, and the broad access to niche markets is an added advantage. What we didn’t like about the company: They don’t cover Tier 1 regions which makes sense, considering their approach to tap into the lesser explored Tier 2 and 3 regions but this limits their reach and variety in offers. Getting down to the meat of the topic, let’s dive into how AdCombo works for publishers and if it lives up to its promises or not. There may be many reasons on paper, but the real reason publishers reach out to affiliate networks is to make money. So, the biggest motivator required to push a publisher to sign with an affiliate network would be a promise of greater payouts. This is the reason why nearly all affiliate networks out there advertise their payout rates to attract publishers. AdCombo does the same but with a twist; the AdCombo Publisher landing page opens with a comparison between a traditional CPA network and AdCombo’s in-house technology. Though the content could have been sharper, the comparison does present a pretty attractive picture of what the company offers to their publishers. Scrolling down the page, you can see the value proposition AdCombo offers and why it stands out from the rest of the competition. At the very bottom of the page, all advantages of joining this network are clearly mentioned, making it easier for the publishers to make a decision. This succinct landing page hits the right chords and is safely among one of the smartly executed marketing gems in the industry. 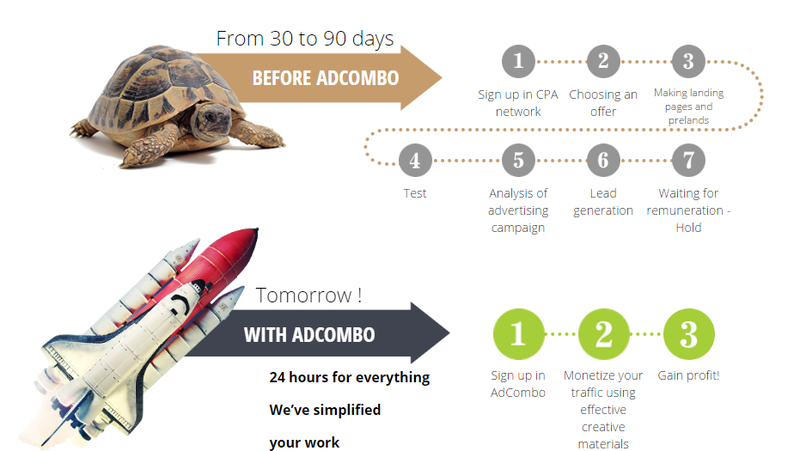 One of the great things about AdCombo is that signing up only takes 24 hours or less if done properly. You start off by filling in a request form which is pretty straight forward. Then after a few hours, an affiliate rep will get in touch with you via email and ask you to give specific information about what you do and what you can do for the network. If you answer all questions effectively, the rep will ask you to come on skype and finalize your membership within the day. Also, the CPA platform is very stringent about its rules and bans publishers who try to cheat the system. Once selected as a publisher, you are given a username and password that takes you to your very own dashboard. Another feature that adds to AdCombo’s effectiveness as a CPA platform is that they have an in-house software platform that promotes easy and fast functionality. The dashboard members’ area is one of the winning features of this platform. The crisp, professional design is easy to navigate and makes it easy for publishers to choose the right offers. AdCombo currently hosts more than 750 offers and publishers can choose from different industries including gaming, e-commerce, home improvement, dating, business opportunities, and more. You can categorize these offers by EPC, Country, and Payout. Once you select an offer, you are taken to a new window where you can set up tracking and promotions for the offer. The platform lets you pick up your tracking URL, set tracking subaccounts, and choose your landing page. AdCombo lets you choose from different landing pages or select all of them and rotate traffic. This lets you split test landing pages and see which one is doing better. Before you select an offer though, be sure to read the guidelines and restrictions such as traffic source, device, promotional methods or any other specifications mentioned. The biggest challenge for AdCombo right now is to develop a stronghold in the market and scale their business to accommodate a greater market reach. Access to Tier 2 Geos: This is one of the most attractive features of this platform. The Tier 1 market is saturated and it is really hard to find affiliates with greater payouts in the region. But the Tier 2 geos, mainly Eastern Europe, South Asia, and Latin America, are mostly untapped and offer a great potential for affiliate marketing. Since AdCombo is directly connected to advertisers in this area, their promise of greater payouts holds true. Quick account set-up and Ease of Operation: Account set-up has become quite the hassle in the last decade or so, especially in the top affiliate platforms. This is partly due to poor management on the company’s behalf and partly due to the sheer volume of requests from publishers. AdCombo impresses with a 24-hour account opening process. Although the security check may be stringent, that just assures quality and shows good business sense. Once a member, choosing and running offers is also comparatively straightforward and the member area is easy to navigate. The best payment terms: Easily one of the shining features of this platform is the easy payment terms. Not only do you have a series of payout options but you have the freedom of cashing out bi-weekly. No other affiliate program offers such a feature. Also, the minimum cash out amount isn’t that high and there have been no complaints of late or withheld payments. The COD (cash on delivery) feature makes it easier and quicker for publishers to make money and e-payments are now available. Exceptional Support Team: AdCombo’s customer service is clearly heads and shoulders above the rest. Every member is assigned to a specific dedicated affiliate manager who handles everything from approving your profile to managing it. Once you become a member, getting in touch with the team only gets easier. You can use a live chat box on your dashboard to get your query answered immediately. The staff is pleasant, helpful, and prompt. No Global Campaigns: The AdCombo platform doesn’t allow you to run global campaigns because it has restricted its market to a single tier. While this works as a niche marketing concept, it also limits your reach as a publisher. Also, niche markets have remained untapped for so long because affiliate marketing is a relatively new concept in these areas, so gearing traction and converting traffic isn’t easy, however, you can use TDS tracker which allows you to rotate geos. The website is too simplistic: Publishers like to make informed decisions. So while a simple and slightly vague website may attract them, the lack of information is likely to put them off. The company’s blog is done well and is updated with relevant information regularly but the website itself offers little in terms of real information like how the platform works, what markets it caters to, what parameters will a publisher be judged on etc. Tune in though, the interface will be re-designed soon. While AdCombo hasn’t really changed the world of CPA Marketing, it has certainly introduced a new and improved way of running an affiliate network. The superior customer service and access to new markets are its winning features. It also doesn’t hurt that the company offers some of the best payment features in the market. Overall, the AdCombo platform is a must-try for all publishers out there.